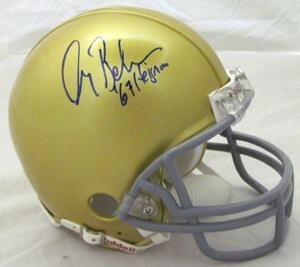 UCLA Bruins throwback mini helmet autographed in blue marker by 1967 Heisman Trophy winner Gary Beban and inscribed '67 Heisman. (This is the same style he wore that season). From a signing with Denver Autographs, with their certificate of authenticity. ONLY ONE AVAILABLE FOR SALE.